Foo Fighters, Twenty One Pilots, The 1975 & Post Malone have been announced to headline Reading and Leeds next year. Following up their sold out shows at the London Stadium (twice) and Manchester’s Etihad, the world's biggest rock band, Foo Fighters, will make their triumphant return to headline Reading and Leeds in 2019. With nearly 30 million records sold, and fresh from packing out the world’s biggest venues – Dave Grohl, Taylor Hawkins, Nate Mendel, Chris Shiflett, Pat Smear and Rami Jaffee will bring their three-hour-plus rock marathon master class back to headlining Reading/Leeds, a tradition they began in 2002. Expect every one of the tens of thousands voices in attendance to be raised with every deafening chorus as Foo Fighters run through dozens of classics spanning their massive catalogue, from their 1995 debut through 2017’s ‘Concrete and Gold’ which went to Number 1 in more than a dozen countries including the UK and US. Grammy Award-Winning Twenty One Pilots (Ohioans Tyler Joseph and Josh Dun) will be bringing their incendiary live show to Reading and Leeds fresh off the back of their worldwide ‘Bandito’ tour and careerdefining show’s at London’s Wembley Arena. The alternative, electro-rockers have inspired a global movement with their flair for dramatic spectacle and world conquering ambition. The duo, now in their ‘Trench’ album era of their career, have seen fans become super fans and set the bar high for a new generation and definition of pop and rock crossover stars. Making their Main Stage headline debut are The 1975. The Manchester four piece have had a phenomenal rise to fame over the past few years, selling out shows across the world and releasing their critically acclaimed second album ‘I like it when you sleep, for you are so beautiful yet so unaware of it’, which debuted at Number 1 in the UK and the US. The album was also nominated for the Mercury Prize ‘Album of the Year’ and was the catalyst to their 2017 BRIT Award win for Best Group, sealing their status as international superstars. Their new album ‘A Brief Inquiry Into Online Relationships’ is out this month with the second in the two-part release planned for Summer 2019. Following a run of UK arena shows in January, Reading & Leeds will be another chance for their loyal legion of fans to see the band’s now iconic live show. Following on from their landmark performance headlining the BBC Radio 1 Stage in 2016, this is set to be another milestone performance, cementing their status as one of the biggest and most exciting bands in the world. Undoubtedly one of the hottest names in the world right now, Texan superstar Post Malone returns to headline Reading & Leeds on his second ever appearance. ‘Posty’ has been on an unprecedented trajectory of success, this year drawing some of the biggest crowds over the entire festival weekend and is now the first act since Nirvana to go from afternoon to top of the bill with a sophomore album in consecutive years. Since being catapulted into fame, the post-modern popstar has had hit after hit including the inescapable ‘Better now’, ‘Psycho’ and the aptly named ‘Rockstar’ and is ready to claim the headliner status. Stockport’s finest heroes of northern indie rock Blossoms are back with a bang, following their recently released album ‘Cool Like You’ which has been dominating the charts. The Amazons who hail from Reading itself have been riding a huge wave of success, with a swelling fanbase and critical acclaim they’ve graduated from ones to watch to festival favourites. They’ll also be joined by The 1975 label mates Pale Waves who are set to get the crowd dancing with their glistening, wistful goth-pop following the outstanding critical success for their debut album ‘My Mind Makes Noises’. London alternative-rock quartet Bastille will be storming the stage with hits from their two Number 1 albums, ‘Bad Blood’ and ‘Wild World’, including the trailblazing single ‘Pompeii’ and current global smash ‘Happier’, as well as songs from their hotly anticipated forthcoming album ‘Doom Days’. 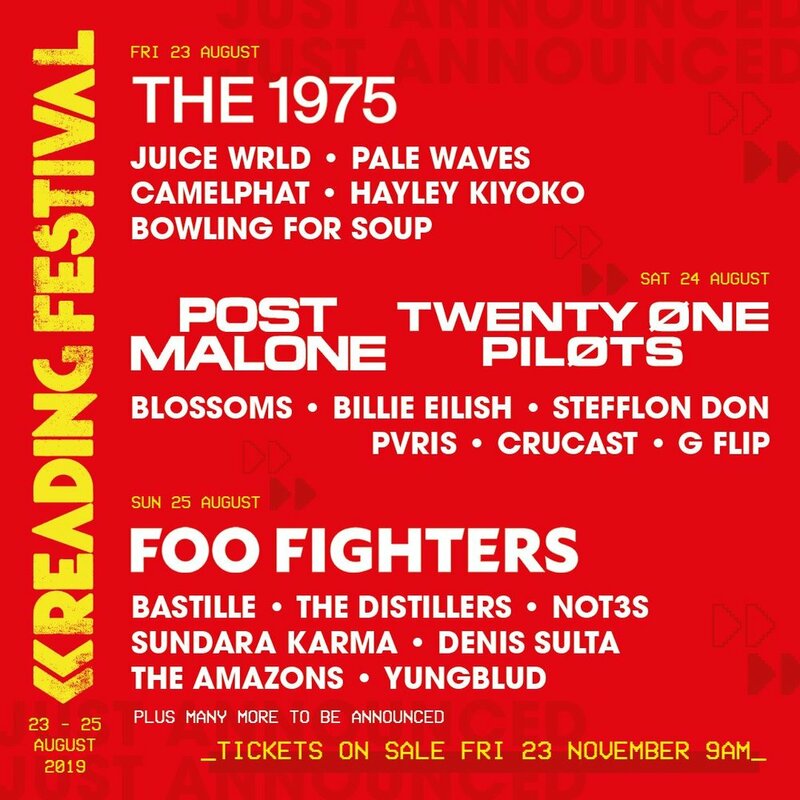 In addition, YUNGBLUD will be returning to the festival after a rave performance in 2018 and is sure to bring something even more exhilarating to fans next summer. Marking their first European announcement, The Distillers return to Reading and Leeds in 2019. They will be joined by Boston based rock trio PVRIS led by frontwoman Lynn Gunn. Other Stateside stars joining the bill are Texan pop-punk pioneers Bowling for Soup who have delivered infectious power pop music to the world for over two decades. Hit singles such as‘Girl All The Bad Guys Want’ and ‘1985’ will no doubt draw huge crowd sing-alongs. The multi-talented Hayley Kiyoko also joins the lineup following her ‘Expectations’ tour which saw her receive worldwide critical reception for her amazing stage presence and vocals. Expect to hear huge hits including ‘What I Need’, ‘Curious’ and breakthrough single ‘Girls Like Girls’. 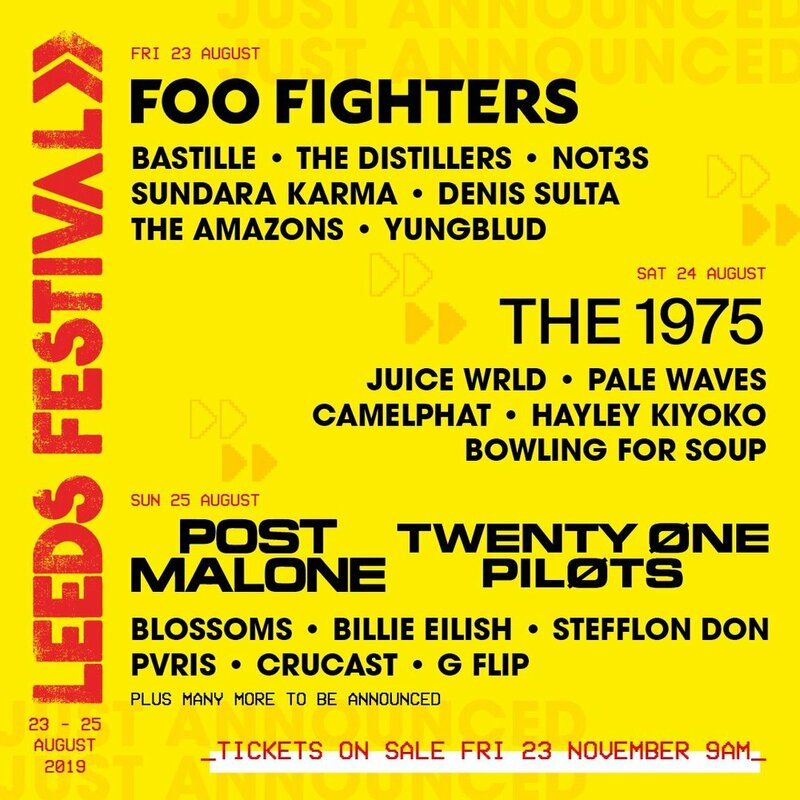 Billie Eilish whose debut single ‘Ocean Eyes’ has had over 132 million streams on Spotify alone is destined to steal the stage with a truly breathtaking performance, while indie favourites Sundara Karma are added to the bill ahead of the release of their sophomore album ‘Ulfilas’ Alphabet’ early next year. Kings of grime beats and heavy basslines CruCast (Skepsis, Darkzy, Bru-C, Mr Virgo, TS7, Lazcru, Window Kid) will get the crowd bouncing, as well as Glasgow DJ Denis Sulta with his vivacious, melodic house tunes. Electronic duo CamelPhat are also confirmed, and with the likes of single ‘Cola’ as one of this year’s stealthiest and most vital dance records, they’re sure to keep crowds on the dance floor until last call. Foo Fighters Announce Headline Show at Glasgow Summer Sessions 2019!